Tomorow,at the military cemetry of Bucharest ,veterans pilots will meet at Serbanescu's tumb stone,like every year,to give him the honors he deservs. I'll be there and let you know how it went. Very interesting but I didn`t met you. Or maybe we talked . Nevertheless it was a great day, but I was sad sawing that only Mr Dobran was there. There were two other bomber pilots and I was very honored to met Mr Popescu Alexandru Viorel who came from Sinaia to `see` a friend. He was a pilot on JRS 79B bomber and he also flew the He111 H bomber. I was very surprised to see that, apart Mr Leo R., no one from this forum could come. I only hope that those who had the possibility to come today at the thomb of a Great Hero will come the following years. Do not forget Al Serbanescu or the other Heros!!!!!!!! I came with Gen Dobran ,who was Serbanescu's last wingman and C-dor Eusebiu Hladiuc(savoia).I was glad also to meet A.Viorel. I was also very disaponted that in those sacred moments a certain person(about 40 years)was talking (it's much to say cause he didn't speek even Romanian correct...)about a very decorated pilot like about a thief(who stoll the decorations and awards he got (risking his life and been severly wonded). It happens that I know that pilot and belive me ,if we weren't in the cemetery I would kick this guys as!. I was told by Dobran that the thumb stone of Serbanescu was changed a few years ago because it was written on it something not so pro Americans(I can understand that). Dobran also found that a few other pilots graves are missing(liKe C.Lungulescu).Seems like those people don't deserve even a grave after their sacrifice! Anyway it was an interesting experince! 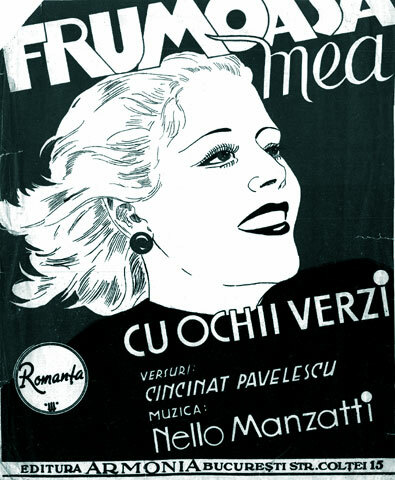 Once I had the chance to read the original "Curentul" printed on August 19. Or it was the one printed on August 20. The owner of the newspaper was Pamfil Seicaru. It was mentioned there the death of the pilot Serbanescu. The article was little, but I think it was on the first page. The head of the newspaper (biggest title, biggest article on the first page) was a speech of the Bulgarian prime minister about the fact that as an Axis satellite Bulgaria had difficult days, and that they will try to find a solution for this problem. As Romania at August 20 had even worse days as an Axis satellite, I think the article was an allusion. As the Romanians say: "Bate saua ca sa priceapa iapa." For the English speaker: "Lash the saddle, hoping the mare will understand." It is said Pamfil Seicaru was a friend of Antonescu, so I wouldn't be surprised that he was aware about Antonescu's negociations. I am sorry... The topic was the death and the commemoration of pilot Serbanescu, but maybe also the other thing may interest somebody. In one month there will be 60 years since the fall of serbanescu. I'd like to ask as many members of this forum to came to the military cemetry in Ghencea,to the anual comemoration. If it's posible also we can coordonate and those who live near an ARR veteran,they can take him with them,and bring him back later. I alredy have 3 vets in my car(that's all my car can take) and Cantacuzino is bringing another one. If someone lives in Titan,Colentina,Tineretului and other places ,he can talk with me and I'll"give "him a veteran pilot. (last year only 3 pilots came). ...So he was shot down in July, not in August? 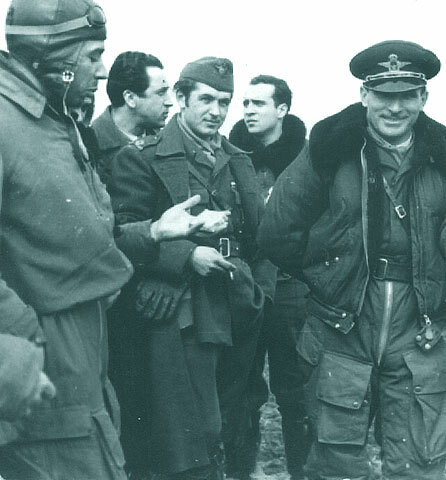 Who was the Romanian ace shot down by the Americans just few days before August 23rd, 1944? PS: Hopefully you'll find people as kind as you regarding the transport of those former pilots, who once were a shield between the Romanian innocent civilians and the American bombers. Yes, it was Cpt. Alex. 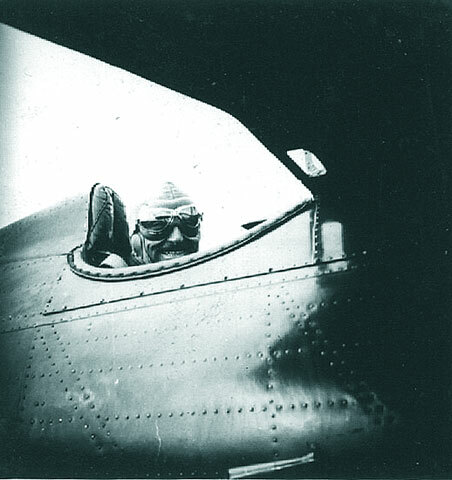 Serbanescu, who was shot down and killed by Mustangs on August 18, 1944. Dr. C-2 was correct: "In one month there will be 60 years since the fall of serbanescu." Dr. C-2 was correct: \"In one month there will be 60 years since the fall of serbanescu.\"
In that moment, my mind was floating in June. I forgot that we are in July. Maybe because I turned the calendar from May directly to July. :? And yes, I missed the meaning of the title which started the topic... Sorry. I've found great images of Serbanescu and his unit, and would like to share them. The picture reads: "Romanian Messerschmitts on the endless Russian plain, always surrounded on all sides by Yaks and Aircobras. At Tecuci, July 1944. fromt left to right; Danaita, Bendas, Milu, a mountain troop, Serbanescu, Radulescu, Senchea, Florescu, Dobran, Dusescu, and in the background a "G" which the mechanics work on. 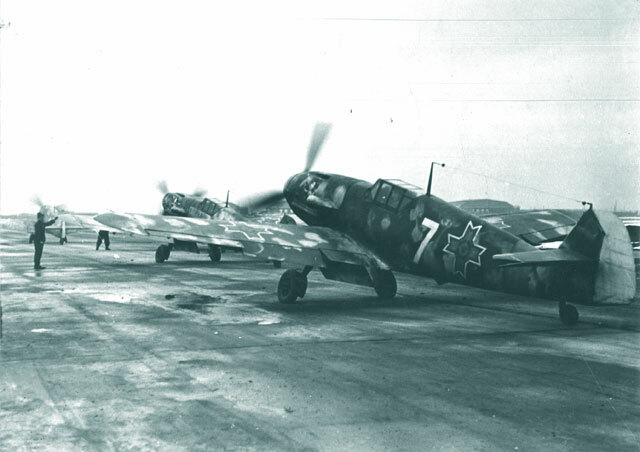 1943, Mizil Aerodrome. 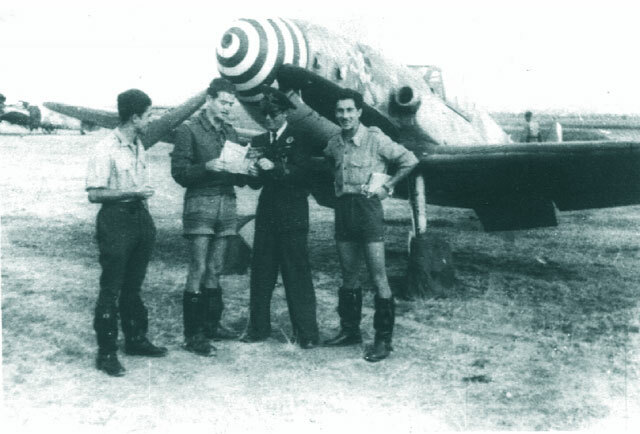 from left to right; Adj-Aviator Economu Alexandru, Adj-Aviator Popescu Constantin, 2nd-Lt Aviator Carciuvoianu V., and Adj-Aviator Encioiu Dumitru Mitrica in front of Mitrica's Gustav. At Nikolaev, 1944 right after the 10'o clock breakfast. 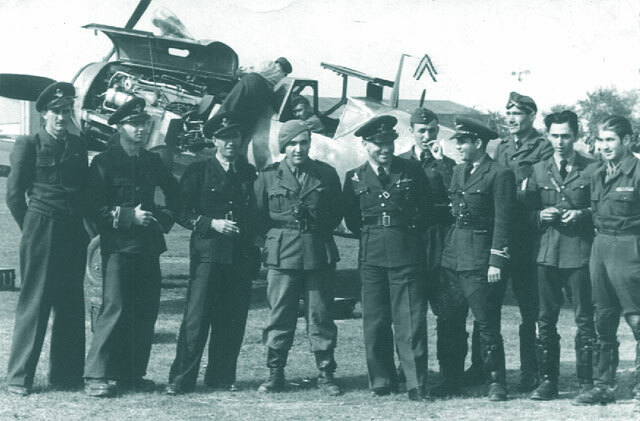 from left to right; Vinca, Greceanu, Mucenica, Stengel, Serbanescu, Lungulescu, Leutnant Ludwig Neubock, unknown, Dusescu, Simionescu, Senchea, Encioiu, Turcanu. It reads the "last two are struggling with a stomach that is not quite ready yet." ?????? what is this ? Photos no. 3 and 4, teh ones with the supposed "Russian endless plains" are of planes and pilots of the 53rd Fighter Squadron, which was never based on an airfield outside Romania. You are correct on your assumption. Also Lungulescu and Turcanu were KIA. The symbols for the rest might represent wound bars. Photos no. 3 and 4, teh ones with the supposed \"Russian endless plains\" are of planes and pilots of the 53rd Fighter Squadron, which was never based on an airfield outside Romania. That's what the picture says, but you'r right. The plane is a Me-109G-2 and belongs to the 7th Fighter group, 53rd Squadron Summer 1943 at Mizil. but, i also found a similar looking plane (without the tricolor) and belonging to the same 53rd Squadron at Mizil in the Summer of 1943 was that of Stefan "Bebe" Greceanu, an ace with 11 kills who was attached to the joint German-Romanian unit I/JG 4. Is this true? 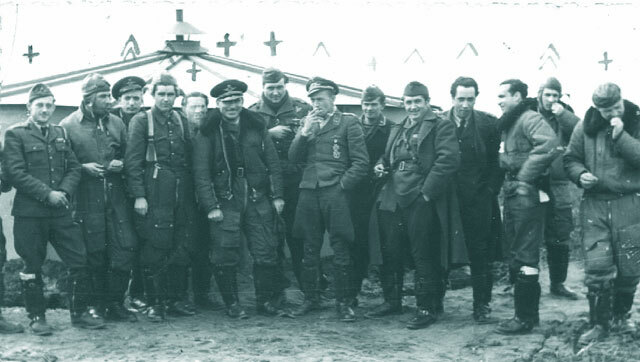 On the original photo, Luftwaffe Lt. Neuböck is linking arms with Serbanescu (here it's cut off). At Nikolaev, 1944 right after the 10'o clock breakfast. from left to right; Vinca, Greceanu, Mucenica, Stengel, Serbanescu, Lungulescu, Leutnant Ludwig Neubock, unknown, Dusescu, Simionescu, Senchea, Encioiu, Turcanu. The airman identified as "Stengel" is not Luftwaffe liaison pilot Ernst Stengl, who was much thinner. The "unidentified airman" is another Luftwaffe soldier.